Prince Reza Pahlavi was poised to carry out his hunger strike publicly outside Federal Building in Westwood, Los Angeles, the hub of a region that is home to around 600,000 Iranian expatriates. FAIRFAX, Va. -- Reza Pahlavi of Iran, in response to a direct invitation by political prisoners in Iran, pledged his solidarity and announced his plans to go on a three day hunger strike starting Friday, June 10. "Solidarity with political prisoners of Iran and support for the legitimate quest for freedom, human rights and economic opportunity in Iran transcends all political boundaries and ideologies," said Reza Pahlavi, opposition leader to the clerical regime of Iran. Yesterday, in a communique, signed by numerous political prisoners, in Iran, the June 17 presidential elections were rejected as "sham and undemocratic." 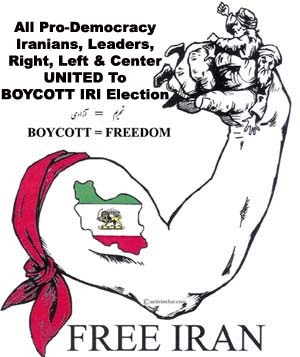 Calling for a boycott of the elections, the communique also cited the regime's abhorrent violations of human rights in Iran and announced the collective plan of the prisoners to go on a hunger strike as an act of nonviolent defiance of the regime. Highlighting the demands of the communique, Reza Pahlavi said, "Iranians of all walks of life demand: freedom of speech; the unequivocal observance of human rights, by the regime; the immediate release of all political prisoners. Just last week, during a press conference in Paris, the 44 year old leader called for a national boycott of the scheduled June 17th presidential election, calling it nothing short of political theatre by the regime. Reza Pahlavi, who has been leading a campaign of political defiance against the Theocracy of Iran, is the former Crown Prince of Iran. He is an accomplished jet fighter pilot and graduate of US Air Force training program at the former Reese Air Force Base. Author of Winds of Change, The Future of Democracy in Iran, he is a Political Science graduate of the University of Southern California. شاهزاده رضا پهلوی در پاسخ به دعوت نامه زندانيان سياسی درون مرز و به منظور همبستگی با آنان روزهای جمعه ، شنبه و يکشنبه (۲۰و ۲۱ و ۲۲ خرداد) دست به اعتصاب غذا خواهند زد. اتحاد همه جانبه و هر چه وسيعتر ايرانيان روز پيروزی را نزديک تر خواهد کرد. opposition leader to the clerical regime of Iran. nonviolent defiance of the regime. human rights, by the regime; the immediate release of all political prisoners. election, calling it nothing short of political theatre by the regime. Audio report from radio farda regarding H.M Reza Pahlavi�s strike. A MUST LISTEN! LOS ANGELES (AFP) - The heir to Iran's throne, Reza Pahlavi, denounced Tehran's looming presidential polls as "theatrics" as he launched a hunger strike to support political prisoners of the Islamic regime. In an interview with AFP, the son of the last shah of Iran called for a boycott of next week's polls organised by the government that toppled his father in a 1979 revolution that sent the imperial family into exile. The 44-year-old royal said he would not eat or drink, save for water to avoid dehydration, for three days between Friday to Sunday to draw attention to the lack of human, civic and political rights of Iranians. "This is in solidarity with political prisoners inside Iran, to demand their freedom and protest the lack of human rights and political liberties in Iran," he said at the start of his protest. "My message to the people is that this transcends any kind of political grouping or ideology. We are all in it together as Iranians," he said, calling for Iranians to stay away from the June 17 poll. Pahlavi was poised to carry out his hunger strike publicly outside government buildings in Los Angeles, the hub of a region that is home to around 600,000 Iranian expatriates. He called on citizens of his country not to take part in the election, which said was not an expression of democracy and would likely be fixed, to avoid giving legitimacy to Iran's religious leaders. "We believe the boycott of the elections will be a very strong signal aimed at indicating to the world that Iranians are not going to give what the regime expects our of these theatrics: to claim legitimacy solely on the basis that people are participating," he said. Four hardline Islamists are among the candidates running to replace outgoing reformist President Mohammad Khatami in a race that is being led powerful ex-president and leading cleric Akbar Hashemi Rafsanjani. But Pahlavi said he had information gathered by activists in Iran indicating that the "majority" of voters in the country of 68 million people would boycott the election. The hunger strike and polls boycott form part of a wider campaign of civil disobedience ultimately aimed at giving Iranian opposition supporters moral support to achieve peaceful regime change, Pahlavi said. He noted that although Khatami was elected under a reformist banner he had been able to do little to break the conservative grip on power of Iran's religious leaders. "People have to see that, although there was an attempt to bring reforms eight years ago, (the regime) will not allow for political overtures," he said. He said Iranians had "long given up hope that this regime is reformable by any stretch of the imagination," and that a non-violent change of government and shift to a secular constitution guaranteeing political and human rights was essential. But the prince said he harbours few illusions that a popular boycott of next week's polls or a rise in political power of the opposition would change the outcome of next Friday's polls, he said. "We should not be surprised that the regime will have its candidate regardless. We urge the international media covering the elections that they (the government) will inflate numbers and cheat on numbers of popular participation," he said. The son of Mohammad Reza Shah Pahlavi and the empress Farah Diba also called on the world community, currently locked in a stand-off with Tehran over its suspect nuclear programme, not to sell out the interests of his people. He urged powers such as the United States and Europe not to reconcile their long-tense ties with Tehran at the expense of the people as the regime comes under pressure both internally and over its nuclear programme. "It's critical for my compatriots to know the world is not turning their back on them in the quest for self determination and liberty," he said, urging governments not to sell out liberty to commercial or other interests. But Pahlavi insisted he was not positioning himself to ascend the throne his father vacated 26 years ago. "This is has nothing to do with restoring the monarchy," he told AFP. "It's about self determination and freedom. "My aim is to serve the country, it doesn't matter in what capacity, as long as I can be of use and it's for the people to determine my future, if any. "My only focus is to get to a point where people are in a position to determine their own future," he said. Prince Reza Pahlavi was poised to carry out his hunger strike publicly outside government buildings in Los Angeles, the hub of a region that is home to around 600,000 Iranian expatriates. 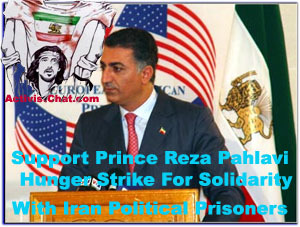 Strongly support Prince Reza Pahlavi for carrying out his hunger strike publicly outside government buildings in Los Angeles where around 600,000 Iranian are living . This action by Prince in solidarity with political prisoners inside Iran, to demand their freedom create a great unity among opposition forces and preparing them for final Battle for regime change. With correct strategy, actions and sacrifice the Prince has a potential to become a great leader. The great leaders are staying in front of their troops. Due to the fact that the armed forces and security forces are paid by the Iranian people they must serve the people interest therefore they must support people against ruling class Mullahs without any hesitation after June 17. - Help Free all political prisoners Now. - The Iranian people have already spoken. The Armed forces must choose between defending and serving the people or serving Mullahs and their EU3 Neo Colonialists Masters. Iranian people should be prepared for final battle of freeing their homeland if all peaceful means for Regime Change on the table fails and must not forget that their FOREVER leader Cyrus the Great died in battlefield in 530 BC at the age of 60 and not in bed. REZA Pahlavi, oldest son of the late Shah of Iran Mohammad Reza Pahlavi, today announced he will hold a three-day fast on behalf of political prisoners in Iran. "Reza Pahlavi, in response to a direct invitation by political prisoners in Iran, pledged his solidarity and announced his plans to go on a three day hunger strike starting Friday, June 10," said a statement from Mr Pahlavi, an opposition leader to the clerical regime of Iran. "Solidarity with political prisoners of Iran and support for the legitimate quest for freedom, human rights and economic opportunity in Iran transcends all political boundaries and ideologies," said Mr Pahlavi, 44. He also renewed a call for the boycott of presidential elections in Iran scheduled for June 17, referring to the elections, which will choose a successor to current president Mohamad Khatami as "nothing short of political theatre by the regime". Mr Pahlavi will hold the fast in Los Angeles where a large community of Iranian-Americans lives, said his office. Mr Pahlavi, 44, has lived in exile since the ouster of his late father, whose regime was overturned by an Islamic revolution led by Ayatollah Khomeini in 1979. Iranian in Los Angeles must show their support, for Freedom, Human Rights, Secular Democracy, Free Society, freeing all political prisoners in their Homeland NOW. This is not about pro monarchy or Pro Republic, or I am not political this is about freedom you enjoy today in Los Angeles , and Iranian people in Iran, your family members and friends in your homeland must have the same kind of freedom . NO EXCUSE can be accepted FROM any Iranian groups from LEFT, RIGHT and CENTER , or those who think it is smart to say I am not political because this action by Prince is demanding for freedom for all political prisoners NOW. Iranian People Inside Iran and Million Iranians in US in favor of FREE society. Due to the fact that TODAY IRAN is hostage to Mullahs and needs our help therefore Iranian Americans community and other Iranians who are residents of outside Iran must be committed culturally and morally to the following poem to support freeing our homeland from Mullahs and their thugs. The Iranian People should apply what Natan Sharansky calls the ``town square test'': if a person cannot walk into the middle of the town square and express his or her views without fear of arrest, imprisonment, or physical harm, then that person is living in a fear society, not a free society. The Iranian People must not rest until every person living in a ``fear society'' has finally won their freedom. Those 600,000 of Iranian People in Los Angeles who find out about this hunger strike event which is not advertised in advance please infom others on this Saturday or Sunday, and they must show up in front of Federal Building anytime of day for at least an hour in Westwood for supporting freedom and FREE society in Iran NOW. WASHINGTON (AFP) - The United States has not waited for the first ballot to be cast before dismissing Iran's presidential election as rigged and exhorting the Iranian people to rise up for democratic reform. IT IS TIME THAT THE HEIR TO THRONE, GETS WITH THE PROGRAM AS WELL... AND REALIZED THE FACT THAT HE DOES NOT BELONG TO A BUNCH OF MELI-MAZHABI GANG LINKED TO REGIME, BUT TO THE NATION AT LARGE! THE NATION HAS DECIDED TO RISE UP BEFORE ELECTION DAY. AND EXPECTS ALL WHO SUPPORT THE FREEDOM TO SUPPORT THIS UPRISING. YOU'RE EITHER WITH THE PEOPLE OF IRAN OR AGAINST THEM. MAKE UP YOUR MIND FAST, AND ANNOUNCE THE RESULTS! LOS ANGELES Wilshire Boulevard has been closed near the Federal Building in Westwood as a Los Angeles Police bomb squad investigates a suspicious briefcase. L-A-P-D spokesman Jason Lee says the briefcase was found abandoned next to a bus bench outside the Federal Building. It was found near the area where a "Free Iran" protest is being held, but Lee says it does not appear to be connected to the protest. Lee says a report earlier that the briefcase was thrown into a crowd at the protest is not true. The statement of Prince Reza Pahlavi in the occasion of latest Iranians' gathering in support of political prisoners. I, too, started my hunger strike in the same day and came to the biggest gathering of Iranian people aboard to be with my compatriots. I came here to say that today, we are not republicans or monarchists. We are not liberals or conservatives. We are not Kurds or Azeri�s. We are not Persians or Arabs. We are not Baluchs or Lurs. Nor are we Turkmen. Today we are all Iranians who rose up to free Iran. As long as there are Iranians in the prison because of their political ideas, none of the Iranians are free. They jail political dissidents to intimidate us. To reign our heart with their fear and to force us to forget our bravery, love and trust to each other. As long as there are Iranians in the prison because of their political ideas, neither elections nor referendum can mean anything. As long as there is no freedom for Iranians to express their ideas and establish their own political parties freely, who can claim that they are aware of Iranians' public opinion? The public opinion is the judge and the jury of every political race in Iran. Without that, where this race will end? How can we be sure that which opinion is the most accepted idea by Iranian people? So, come closer my compatriots and let's start our final battle shoulder to shoulder, by fighting for the freedom of all political prisoners in Iran. They are jailed only because they believe in freedom of speech and independent political and social parties. This struggle is against an anti-Iran and anti-Iranian regime and for establishing a national movement, beyond the ordinary political boundaries. Today, we are not republicans or monarchists. We are not left or right. Today, we are all the fighters for Iran's freedom path. Thank You Prince Reza Pahlavi for clear and prefect statement.